On September 1, 1715, King Louis XIV of France died. With his passing, the “Great Century” (the age of Louis XIV) came to an end. During that monarch’s reign, France became not only the most powerful nation in Europe but the undisputed leader of European culture. Throughout Europe, aristocrats took on French ways and spoke the French language. They built houses and public buildings in the French style, and the artists and writers they patronized imitated the patterns of French art and literature. Louis XIV may have been the most feared ruler in Europe, but he was also the most envied and imitated. The following essay was written by Kendal Rowan, a 7th grade student at St. Augustine High School in New Orleans, LA. Katharine Drexel was born on November 26, 1858 in Philadelphia, Pennsylvania. She was the second of two daughters. Her father was Francis Anthony Drexel, a wealthy banker and philanthropist, and her mother was Hannah Jane Langstroth. Katharine’s mother, Hannah, died a month after her birth. Two years later, her father married Emma Bouvier, who became a devoted mother to her. She had a daughter in 1862 and played an important role in all three girls’ lives. Both parents gave the children love and guidance. Katharine and her family were wealthy, but her parents taught them that they were to share with others. They were encouraged to do things on their own without money and to help those who didn’t have. Katharine was home schooled as a child. Even though she and her sisters didn’t go to school, they had a good education. She was able to travel the world going to Europe and all over the United States. During her travels through different countries, Katharine Drexel learned of many things Native Americans could not do and what they didn’t have. Later, she decided to use her inherited fortune of wealth to help the Native American race with some of their problems. This goal started with a Native American school she established in 1885 in Santa Fe, Mexico. She was a faith filled person who did things from the heart. After receiving a suggestion from Pope Leo XIII, it gave her the idea of becoming a missionary. Katharine had to go through training in religious life; so, in 1889 she decided to join the Sisters of Mercy in Pittsburgh. During her religious training, she never lost sight of giving back to others. Two years later, with a few companions, Katharine founded the Sisters of the Blessed Sacrament. The Sisters of the Blessed Sacrament is still in existence as of today. Mother Katharine Drexel, as she came to be known, formed this missionary for Indians and Colored People. This missionary is because of the love she had for the deprived people in her country and her devotion for the sacrament. Something her parents instilled in her as a young child. During her life, she helped to open approximately sixty schools with her congregation. The one school that she was most famous for establishing was Xavier University of New Orleans in 1915. This was the first Catholic institution for historically Black people in the United States. Xavier has expanded from day to day still focusing on what Mother Katharine Drexel envisioned for the black community. She also purchased the campus of Southern University that was previously located on Magazine Street in New Orleans. After it was abandoned because white neighbors pressured the blacks to leave, the college relocated to Baton Rouge. Once the abandoned property was obtained, she named the school St. Francis Xavier after a great missionary in 1912. She had no desire to please others, but the desire to do what she thought was God’s will. The school was later known as “Xavier Prep”, but today is now called “St. Katharine Drexel”. In 1935, Mother Katharine Drexel had a heart attack and her health began to fail. She later decided to step down as the superior general in 1937 because of serious illness. Her devotions grew stronger as she battled with her illness and she never felt the need to deprive others because of her struggle. On March 3, 1955, she died at the age of ninety-six at Cornwell Heights, Pennsylvania. Katharine Drexel made a great impact on many people who knew about her Christian works through the Catholic religion. But, the most important thing about Katharine Drexel is that she established many schools and missionaries by opening her arms as God does to help others for the cause of great Christian Acts. It is reported that she became beautified on November 20, 1980 by Pope John Paul II. As a young black male I admire Mother Kathrine Drexel. She helped many people including young African Americans and more. She was a great woman; even when sick she still helped. All she wanted to do was to help other and be devoted to a cause using the abilities that her parents taught her throughout her life. She did many good deeds for many people and that was what God wanted her to do. On a summer’s day in August 1819, tens of thousands of people gathered in St. Peter’s Fields, near Manchester, in Lancashire County, England. They had come, summoned by radical leaders, to hear the reformer Henry Hunt give a speech on the causes he stood for — yearly elections for members of Parliament, universal manhood suffrage, and voting by secret ballot. Great throngs of people had begun to arrive a little before noon on that day, August 16, 1819. Many carried flags, some marched in formation, others — men, women, and even children — were there any which way. In the end, 60,000 to 80,000 people surrounded the cart from which Hunt was to give his address. Hunt had not been speaking long when he espied a body of cavalry, its members brandishing their swords and advancing at a brisk trot toward the crowd. Hunt paused in his speech but then resumed it, assuring his listeners that the intruders had come only to disturb the meeting. But then he saw the multitude before him make way; the cavalry had pushed its way into the crowd and was coming toward him. When the soldiers reached the cart, the commanding officer, with drawn sword, told Hunt that he was a prisoner. Another radical leader, named Johnson, was also arrested; others for whom warrants had been issued escaped into the crowd. One of the best reasons to study California mission history is that it is just a good story — a dramatic story of heroic sacrifice and even martyrdom. It is a tragic story, too, for it tells of the promise of the mission system and how it was ultimately destroyed. California mission history is anything but boring. But there are other reasons students should learn about California’s Catholic mission system and the dedicated men who established it. Catholic students need American Catholic heroes. American history provides a number of great men and women for students to admire and emulate — but most of these are not Catholic. Young American Catholics need to learn that the Church has not been lacking heroic witnesses, not only in the Old Country, but in the lands that today form the United States. Among the most significant of these witnesses are Blessed Junípero Serra and the Franciscan missionaries in California. To miss out on their story is miss out on one of the most important chapters in American Catholic history. Catholic students should know that Catholic cultures have flourished in North America, including that part of the continent that became the United States of America. Though Catholics have always been a minority in the United States, they have brought to the country rich traditions and cultures influenced by the Catholic faith. One thinks of the Cajun culture of Louisiana, the various German Catholic settlements of the Midwest, the Italian and Irish and Slavic enclaves in America’s great cities, or the Hispanic culture of New Mexico. To these we must add the Hispanic culture of California that first flourished in the Franciscan missions. To the Pilgrim Fathers and the founders of Jamestown Fathers, why not add the Franciscans of California? Much of U.S. history focuses on what happened in the East, which has led to a certain imbalance – for there is a rich history of the West that students should know as well. Studying the history of early California helps students attain a better balance in their understanding of the history of their nation. Even non-Californians should know about California. For good or ill, California is one of the most influential regions in the United States. It influences much of American culture and politics. It is not an exaggeration to say that one needs to understand what has happened in California before he can fully understand what has happened in the United States. The Franciscan missions and what happened to them form an important part of the history of California. They are the foundation of the settlement and culture of the state. 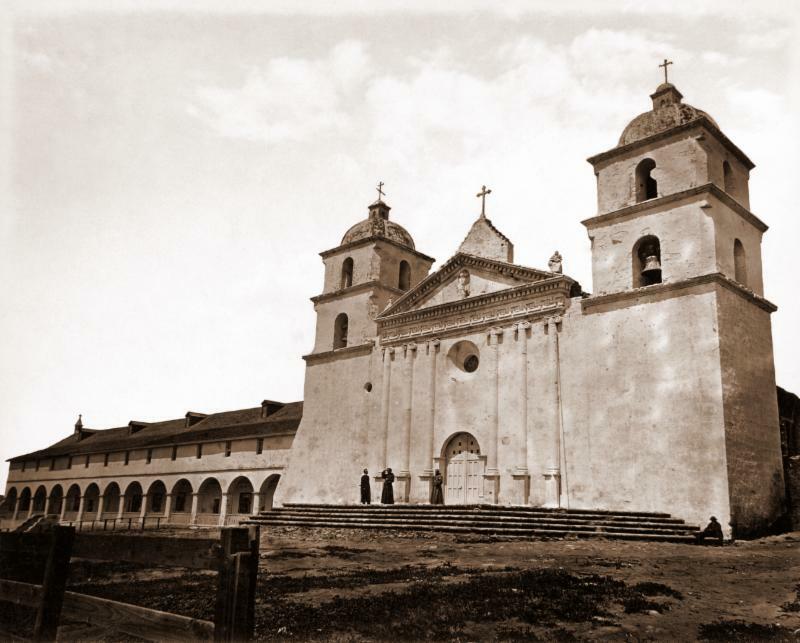 The ideals that inspired the California Missions provide a Catholic vision of how Europeans and Native Americans could have lived together in justice. The story of the interactions between Europeans and Native Americans in the United States has been a sad one. Throughout the nineteenth century, in particular, people asked the question, how can Indians and whites — peoples with profoundly different cultures — live together in justice? The Franciscans in California provided an example of how this could have been done. Why they failed to achieve their ideal is equally instructive to students, who must learn to do what is right in a society that is at times opposed to their ideals. Studying the California Missions will help students deal with the exaggerations and falsehoods leveled against their founder, Blessed (and soon to be Saint) Junípero Serra and his successors. The California mission system was never perfect (the Franciscan missionary fathers themselves admitted this), but it has been the target of attack for well over two decades now. Junípero Serra has been accused of cruelty and even genocide. To understand such criticisms, students need a balanced view of the mission era of the missionaries, with all their strengths and weaknesses. The history of California — like the histories of the various Latin American countries — helps students better understand the cultural and political ideals of the United States. Often we understand our own culture by comparing it with another culture. This is especially true when one set of ideas influence different cultures in very different ways. The political and social ideas that helped form the United States were at play in Hispanic or Latin America — but with sometimes very different results. From 1769-1846, California was an outpost of Hispanic America. California’s history can thus help students better understand U.S. History. “The Rise and Fall of the Missions of Alta California” — Christopher Zehnder, MA, is offering this class, for grades 7 and up, through Homeschool Connections, for the 2015-2016 school year. Mr. Zehnder is general editor for the Catholic Textbook Project, and is the author of three of the project’s books: From Sea to Shining Sea: The Story of America; Light to the Nations II: the Making of the Modern World; and Lands of Hope and Promise: A History of North America(available this Fall). For more information, please see Homeschool Connections course catalog. For registration information, please go here.